Sam receiving his Derbyshire School Sports Awards 'Young Leader of the Year' award. Managing Melbourne United Under-13 and supporting Melbourne United teams from Under-11 to Under-16. Completing Level 1 and 2 coaching qualifications as well as football refereeing award. Sam, at 17, has shown how his impact as a volunteer has been positive both within school and community settings. Lewis Adams, Sport Development Officer at Derbyshire Sport said: "It is important to highlight the good work that young volunteers such as Sam do in Derbyshire to help the younger generation have a voice within sports clubs. "I am sure that Sam's story will inspire other young people to volunteer not only within their school but out at their local club." 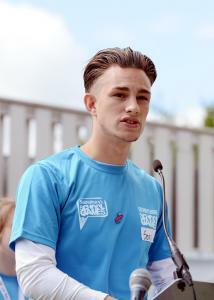 Sam speaking at the Derbyshire School Games Event 2015. Sam was also selected for the Derbyshire County Young Leader Management Team; the group aims to give young sport performers a voice and also to plan and deliver festivals and events for these performers. He started on this group as an administrator then moved onto a team leader role that involves holding meetings, managing the 10 members and leading projects, such as Derbyshire FA disability football events. 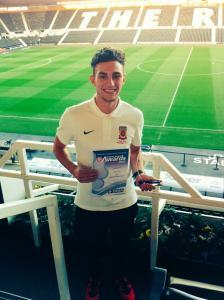 Outside of football, Sam has contributed 250 hours to the Derby City School Sport Partnership Leadership Academy and became an Adi-star, gold and elite young sports ambassador. In 2014-15, Sam has delivered open evenings, appeared on BBC Radio Derby and opened the 2015 Derbyshire School Games Event. As part of the leadership academy, Sam's team won the 'Best Young Leader Run Event' at the national Young Ambassador Celebration day at Wembley Stadium. He was recognised and praised for his question and answer session with Paralympian Sam Ruddock. The Young Ambassador work has led to Sam joining the UK Young Ambassador Steering Group and attended events such as the Youth Sport Trust Manifesto Launch at the House of Lords. Sam's commitment to leadership and volunteering led to him receiving the Derbyshire Schools' Sport Association (DSSA) 'Young Volunteer of the Year Award' in September 2015. Watch why Sam was a worthy winner of the award. If you have been inspired by Sam's story, find out where you can get involved by searching for volunteering opportunities on the Derbyshire Sport website or on the national Join In website.